You are here: Home / Raw Islam / Raw Islam 49: How Do We Change The Narrative? 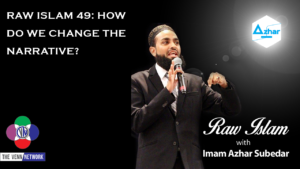 This week on the Raw Islam Podcast with Imam Azhar– a 2017 Podcast Award nominated podcast, our question of the week is how do we change the narrative? On the heels of #PunishAMuslimDay, some very clever Twitter users started using the hashtag #PublishAMuslimDay – so B.C. Dodge opens this show by saying thank you Hend Amry, or @LibyaLiberty , for pointing out this podcast to her followers. Imam Azhar goes on to say that in 2018, the fact that we have a “Punish a Muslim Day” is a very disgusting mark on humanity. He points out that over the past year we have seen the results of demonizing one another based on faith, background, or skin color, yet here we are having this conversation. However, given the state of social media, and the narcissism that it is causing, is it possible that we not only want people to say acknowledge what is happening – but our gage for what sympathy is has moved as well? Are we looking for someone to say, “I am sorry that is happening to you because you are X, Y, or Z.”? Beyond that, Imam Azhar asks by making these hashtags, by engaging in the conversation, by searching for that sympathy – what in our actions showed that we were trying to find the conversation? Were the actions that were taken helpful?